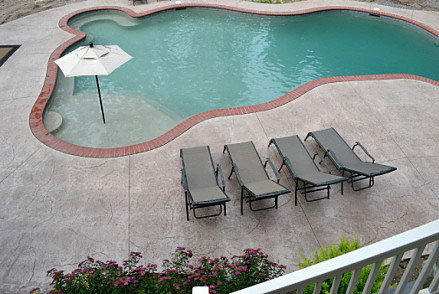 It is becoming a big trend in outdoor design today to use decorative concrete for your pool deck. It's a colored, textured and inviting area surrounding your new pool that does more than provide a safe, slip-resistant deck for sunbathing and barbecuing. The outdoor living areas are now given just as much attention as the interior design of your home. Using Stamped Concrete has opened the doors to creating outdoor living areas that complement the exterior of your home and replicate the more expensive materials such as slate, stone, and pavers. 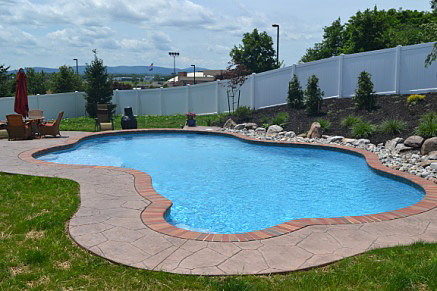 With multiple stamp patterns available and over 40 different colors for designing of a functional, durable, unique and affordable pool deck is right at your fingertips. We at Dan-Tam Concrete are one of the most reputed companies in stamped concrete field. 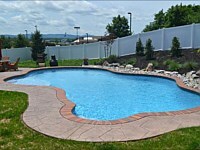 We cater to clients in Dillsburg, PA and the surrounding areas. 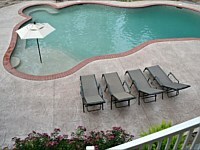 Creating superb concrete pool decks is something we do with a great amount of expertise and attention to detail. 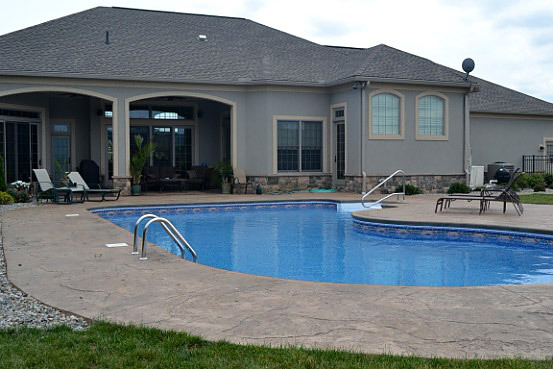 We have been operating in this industry for almost 30 years, and have the ability to provide you with the kind of stamped concrete pool deck that can be a true value-add to your home. We understand that homeowners look for cost-effective solutions when it comes to landscaping installations. Aside from this, all of these spaces are open to the air, making it very necessary to use materials which would be able to weather the elements well. 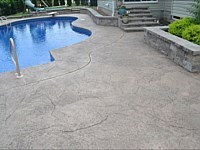 This is exactly why we recommend the use of stamped concrete for pool decks. 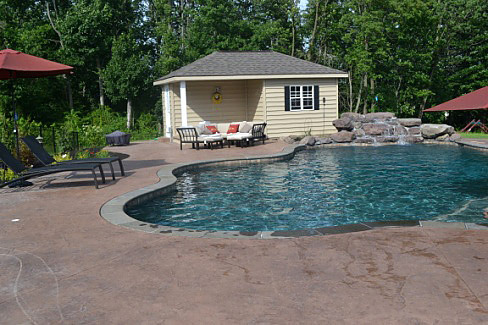 This is a time-tested material that has been used on all types of pool deck areas very successfully. We use the latest techniques, the best materials and deploy skilled concreting professionals in all our projects. 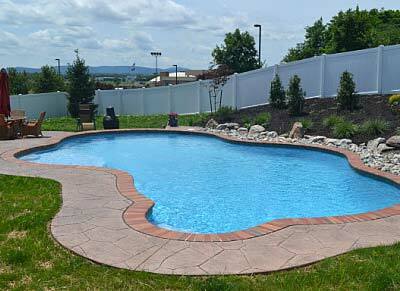 This attention to detail and focus on quality is reflected in the stamped concrete pool deck installations that we handle for you. When you hire us for the job you have peace of mind that skilled and highly experienced professionals are handling the job. 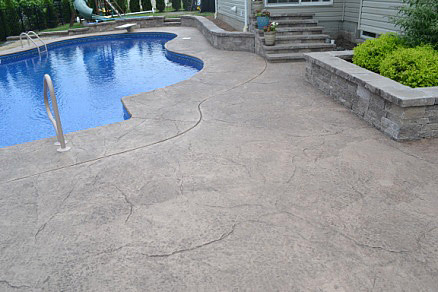 We know exactly how to use this simple material to create unique and stunning concrete patterns around your pool space. We recommend the use of concrete texturing on the surfaces as this provides better traction in the poolscape, which adds to the safety aspect of the area. Our creativity and skill is unmatched and this means the installations on your property will always be superb in every way. We make sure that your new concrete pool deck would be the perfect extension to the beautiful indoor areas of your home. 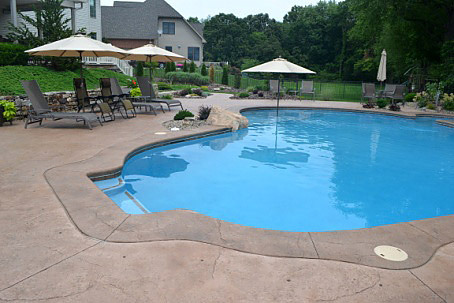 We have handled pool deck concreting of all shapes and sizes. 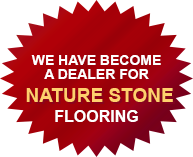 Our commitment to quality and the fact that we offer very cost-effective solutions is what set us apart from many other local stamped concrete companies. 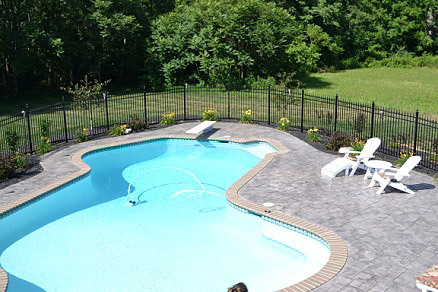 If you want custom pool deck stamped concrete solutions, feel free to contact Dan-Tam Concrete at (717) 528-7133. You can also send us your queries and project specifications via this Contact Us form and we will revert shortly to have detailed discussions about your requirements.